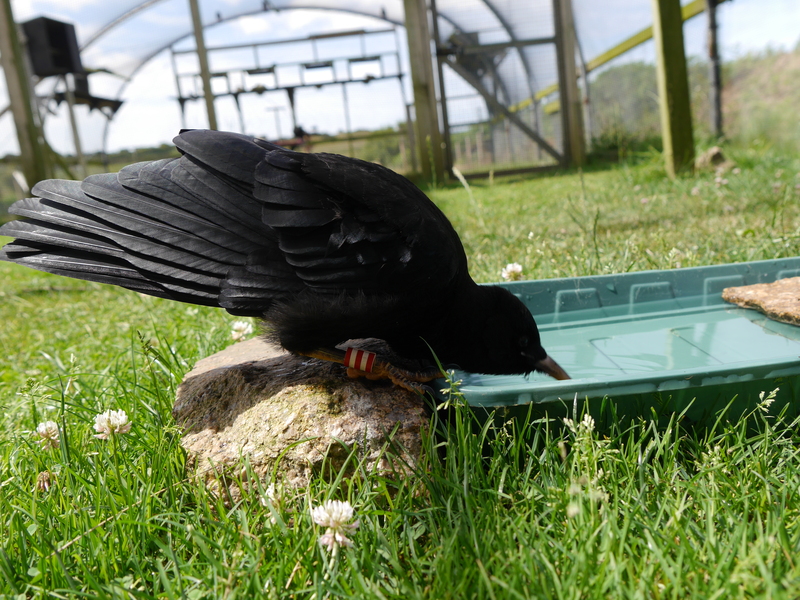 Jersey’s first wild chough chick in one hundred years made its maiden flight out of the nest on 2nd July. 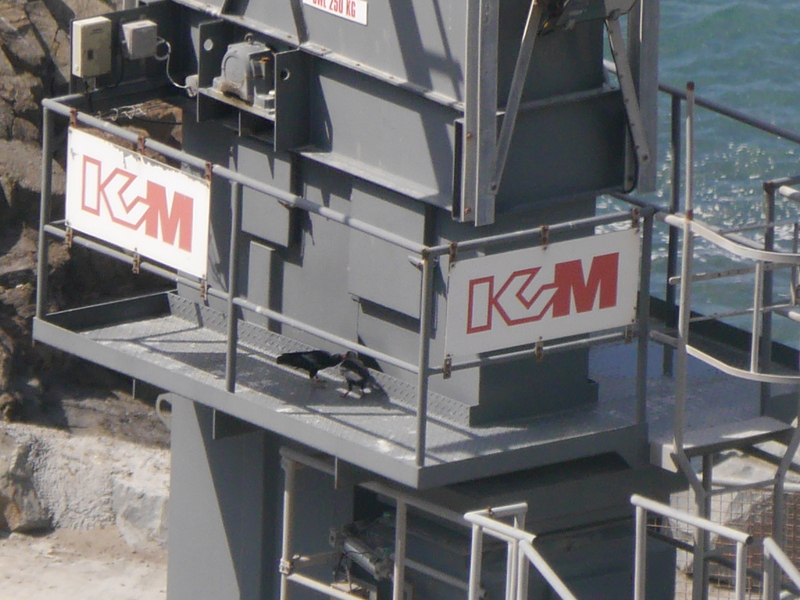 Well at least we assume that is how it made it up to the top of one of the tallest buildings in the quarry. It was a long time before we actually witnessed a ‘flight’ and even then it was best described as a choreographed fall. Or was it pushed? Dusty with parents on the first day away from the nest building. Photo by Liz Corry. 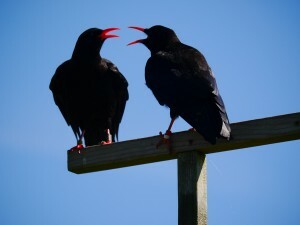 Chough chicks spend a while walking and jumping around the nest site learning all the basics before actually taking flight. Dusty, named by Ronez quarry staff, did exactly that only in this case Dusty left the busy quarry building his parents had nested in and chose the very tall ‘climbing frame’ next door to play around on. Dusty’s parents, Green and Blue, stayed very close to their chick for the first few days. The video below shows them training Dusty. They would fly up and perch next to Dusty then take a short flight around the building and back trying to encourage the chick to do the same. Time after time they tried but Dusty was having none of it, which is why we are a tad suspicious of that first ‘flight’. Parents feeding their wild born chick in the quarry. Photo by Liz Corry. Dusty did make a few flights around the top of the building over the next few days, but didn’t have much need to go elsewhere. Why would you when your parents are bringing you food and you have one of the safest play areas a chough could want? Green and Blue adopted a different approach to encouraging Dusty away from the buildings. Starvation. 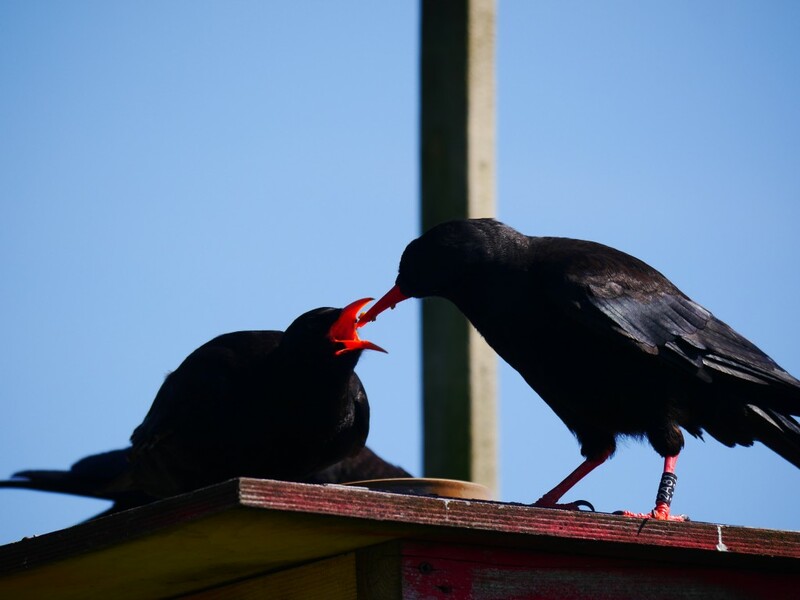 I’m not suggesting this is an appropriate, or legal, parenting technique, but in the case of a chough it worked. Not quite as extreme as it sounds. It simply meant the parents were spending less time with Dusty and more time foraging with the flock. They would still return with food for Dusty from either the aviary or the grazed cliff tops, just not as often. Instead of short demonstration flights around the buildings they would fly across the bay to Sorel Point. 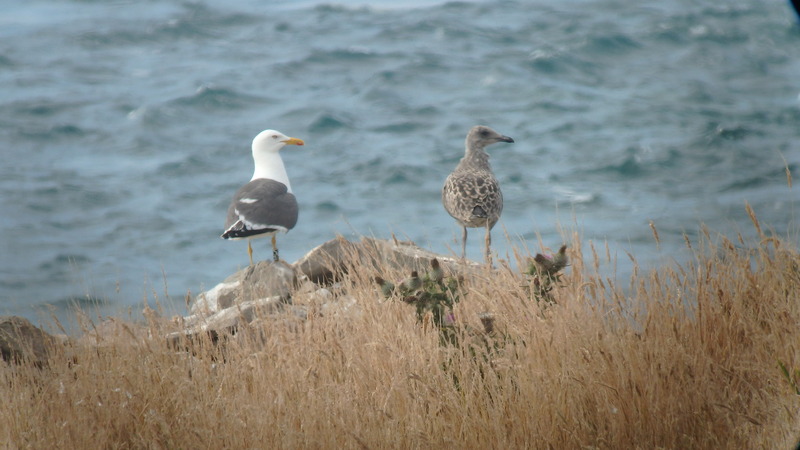 Exactly a week after leaving the nest site, Dusty ‘s hunger to be with mum and dad (in both senses of the word) overcame its insecurities and the first flight to Sorel Point was made. Then they kept flying! 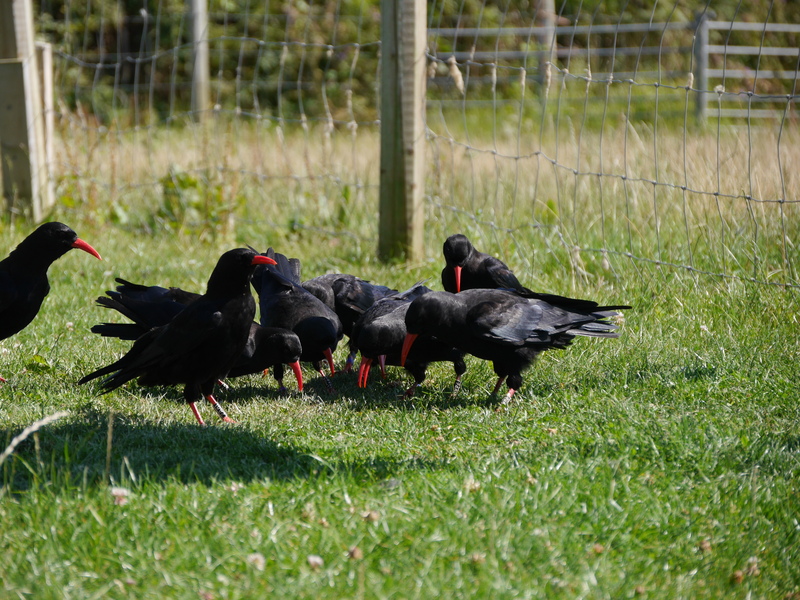 All the way around to the grazed fields by the aviary to join the other thirteen choughs. Dusty and parents coming into land at Sorel. Photo by Liz Corry. It wasn’t long before Dusty went to the aviary. At each supplementary feed when we called the birds to the aviary Dusty would be following eagerly begging for food of mum and dad. However, it took a long time for Dusty to pluck up the courage to actually go in the aviary. Initially it might be fair to say the optical illusion of the netting might have confused the youngster. Dusty on the outside of the aviary begging to parents inside. Photo by Liz Corry. Very quickly it was apparent that Dusty was wary about going inside. This was actually really encouraging to observe as it meant the chick wasn’t naïve. Having been raised by captive-bred parents in relatively close proximity to people you might think that this chick would be a little too comfortable around potential threats. Dusty will now go in the aviary visiting the food dishes on the target boards and has even landed on the weighing scales. Mum and Dad are still feeding on demand although you can see them trying to encourage Dusty to become more independent. The general method being deny and ignore. It doesn’t always work and we have witnessed a few scuffles between Dad and chick. 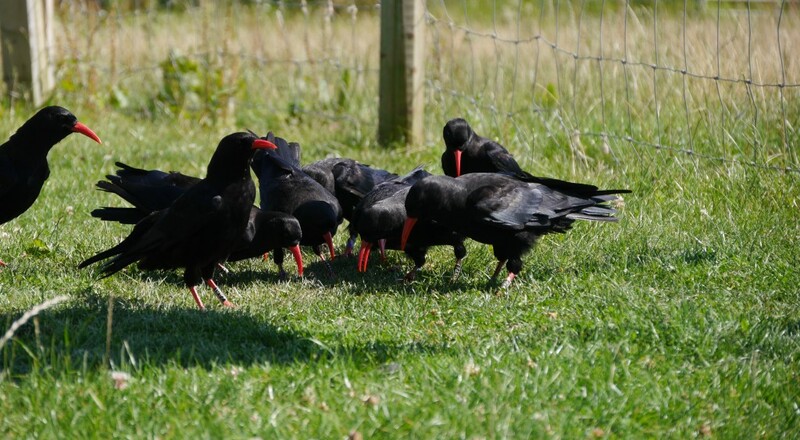 The other choughs have accepted Dusty into the flock. There has not been any change in behaviour due to an additional member. Even one as noisy as Dusty. They have started exploring new ground at Sorel looking for insects. The grazed headland is quite hard and compact at this time of year as the sun bakes the soil. The insect larvae available in the soil will be quite hard to get to. 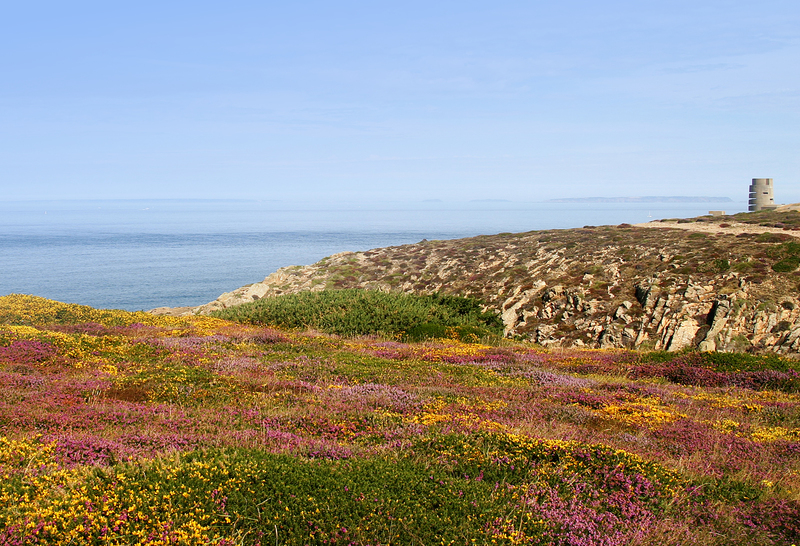 The grassy slopes leading down to the sea have looser soils and appear to be more inviting for the choughs right now. 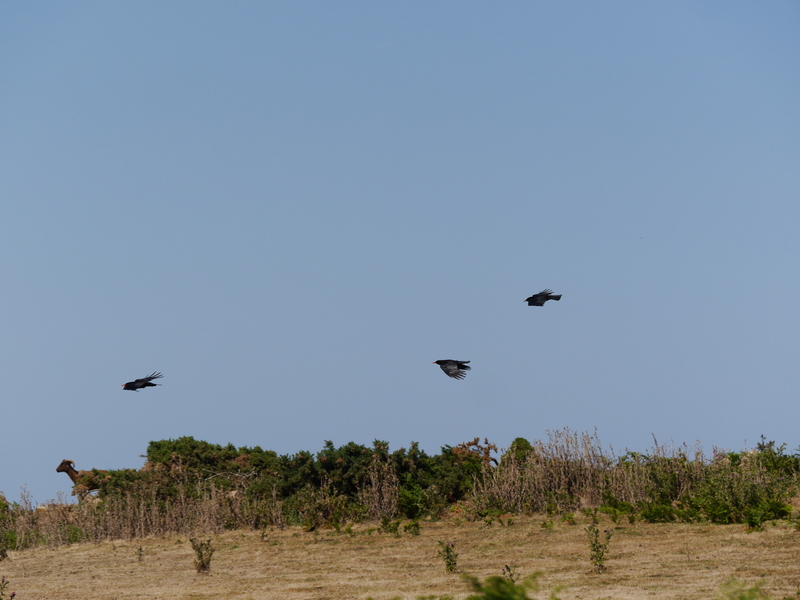 They are still going through their moult, as shown by the chough in the flight in the photo below. They look a bit scruffy, but it isn’t stopping them from putting on their famous acrobatic flights of fancy or maneuvering away from an incoming peregrine. The latter has happened on several occasions this month as the young peregrines are out and about learning their trade. 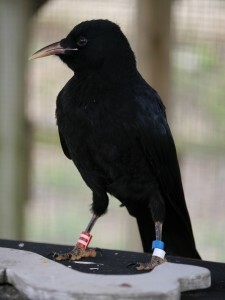 There has been one change at Sorel which effected the free-living choughs more than Dusty‘s arrival and that was the import of eight parent-reared chicks from Paradise Park. 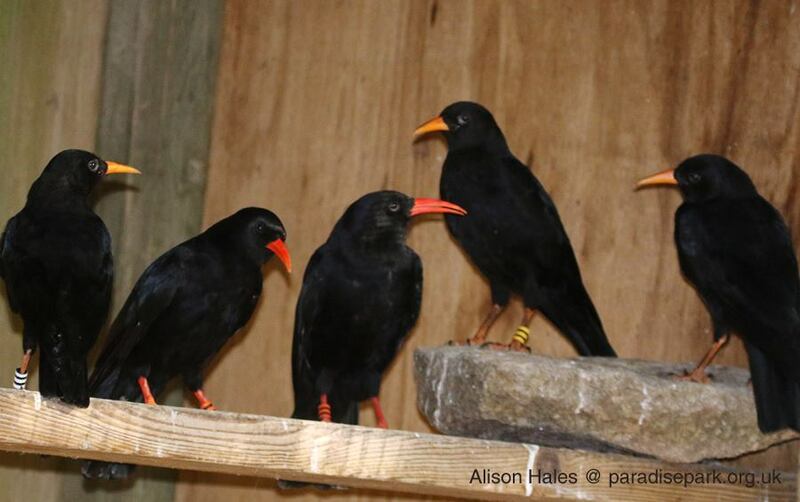 The team at the wildlife sanctuary in Cornwall have had another successful breeding season. They kindly agreed to loan Durrell eight of the eleven chicks that had successfully fledged this year (fully expecting not to see them again unless on holiday in Jersey!). Even better news was finding out that the DNA sexing results show we have four males in the group helping to address the balance out at Sorel. Three of the parent-reared chicks with their parents at Paradise Park, Cornwall. Photo by Alison Hales. Once again Lee Durrell and Colin Stephenson eagerly stepped up to offer to fly over and bring back the lucky eight. On the 16th July the three-month old chicks were caught up, crated, and driven to Perranporth airport by Ray Hales and curator David Woolcock. We made it through the very localised Cornish fog and cross winds to land around 1pm. 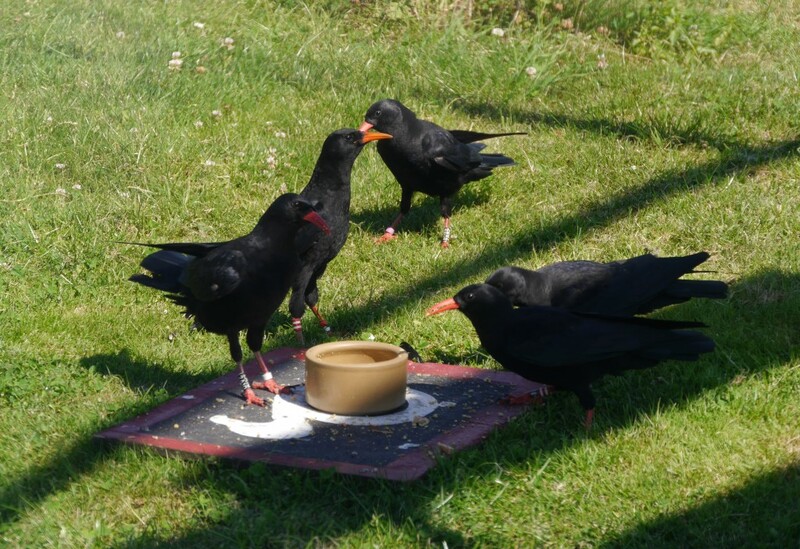 After a brief refuelling of a bacon roll, cup of tea, and a catch up with friends, we loaded the choughs onto the plane and taxied off for our return to Jersey. An hour later we had landed and met by Dennis Moseley, Head of Operations, in the Durrell van to take the choughs on their last leg of the journey to Sorel. 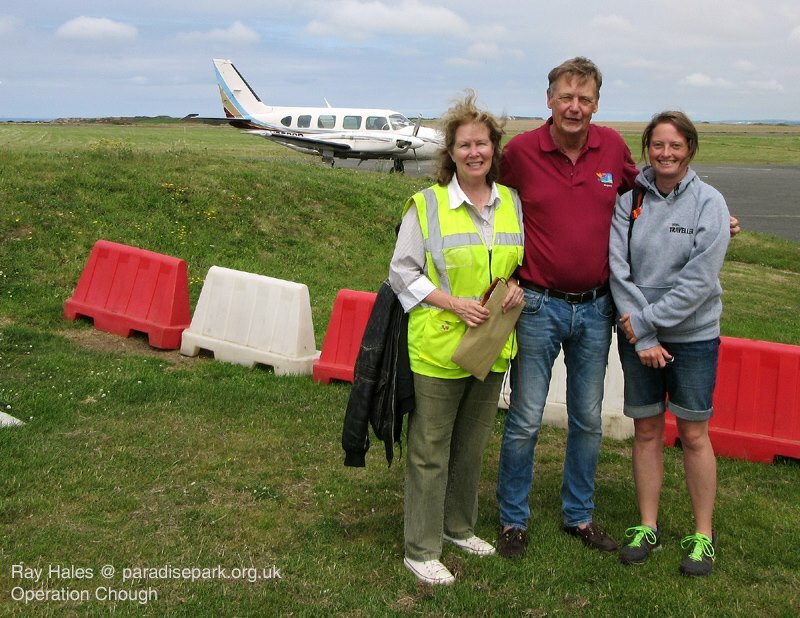 Pilots Lee Durrell and Colin Stephenson alongside Liz Corry at Perranporth airfield to collect the chough chicks. Photo by Ray Hales. Once at Sorel their ordeal wasn’t over as they then had to go through their vet checks which included blood and faecal samples. The quarantine process began as soon as they entered the aviary and lasts for 30 days providing they all pass their tests. Feacal samples are submitted every seven days and tested at Durrell’s laboratory. For the first week they were kept in section 1A separated from our hand-reared chick to allow them to settle in. We then gave them access in with our chick so they could socialise together. Initially the parent-reared chicks were very scared as you can imagine. 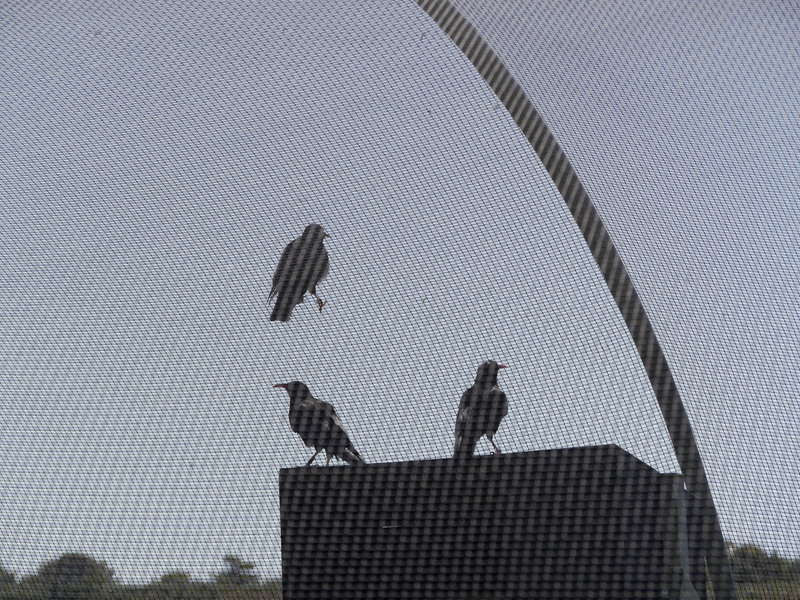 They quickly learnt to associate the arrival of the free-living group at the aviary with food provided by staff. We don’t know yet if they are responding to the whistle as the logistics of training the group and feeding the other sixteen at the same time is very challenging. 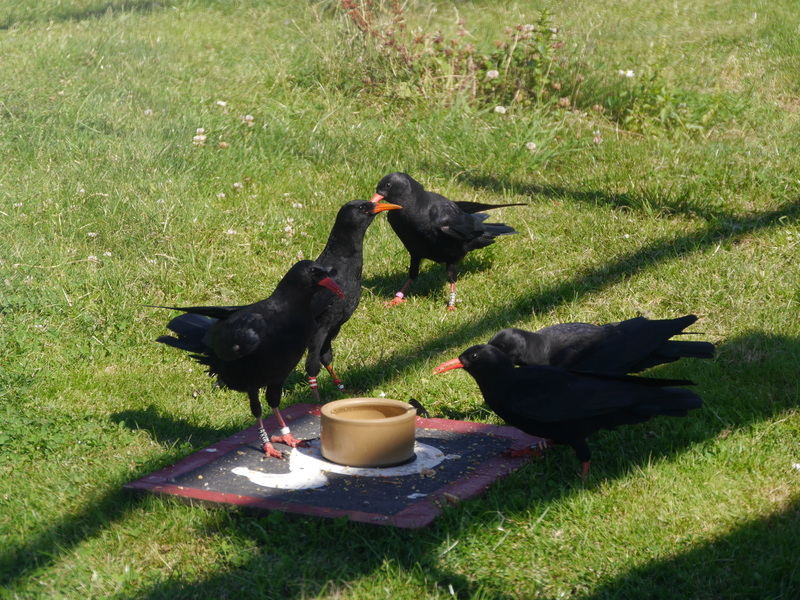 Throughout this the free-living choughs could still enter the aviary poly tunnel, but locked out of the shed sections (1A and 1B). This meant that the eight juveniles who normally roost in section 1 were forced to find alternative roost spots. Once the 2015 chicks have access to the entire aviary the free-living group will not be able to go inside the aviary until we start releases. Sunset at Sorel. Photo by Liz Corry. 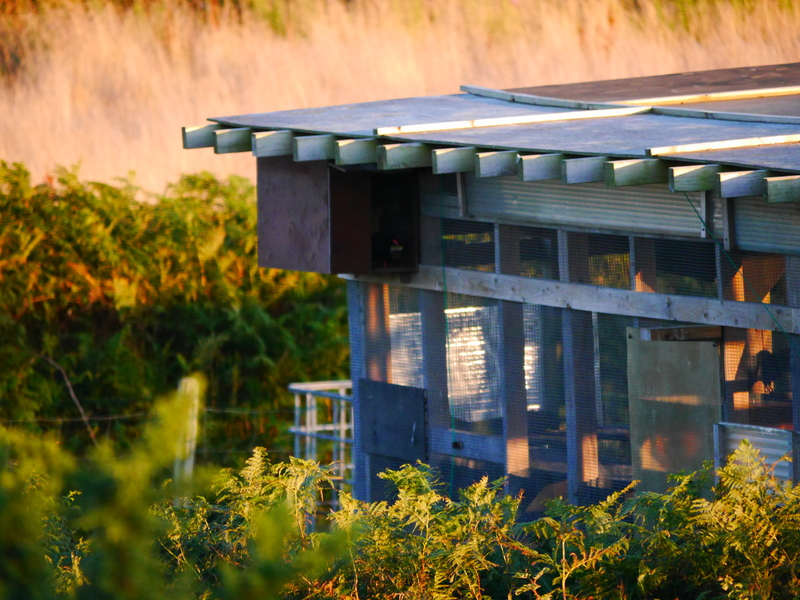 A roost check from 19:30 until 21:00 (sunset at 20:50) confirmed that the juveniles were still sleeping at the aviary, but using the external roost boxes next to the parent-reared chicks. It also highlighted what happens when people get too close to the aviary at the wrong time of day. The birds had already gone to roost by 19:50, spending the rest of the daylight hour to preen and tidy up. A couple approached the field gate and started to open it. This sent the birds out of their roost boxes and off to the other end of the aviary where they watched the couple closely. 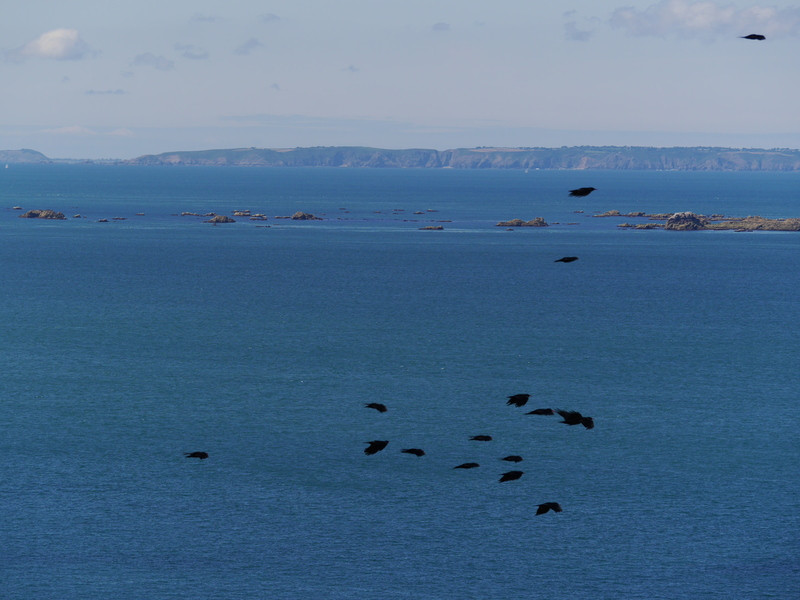 As the visitors got closer the choughs flight or fight response kicked in and the flew….off to the cliffs out of sight. The birds locked in the aviary started to panic flying around in a confined space. 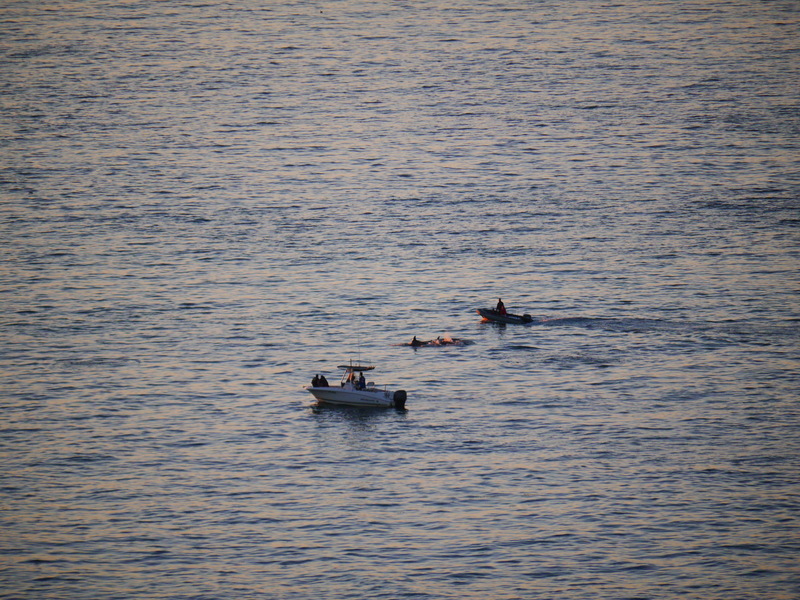 The couple clearly meant no harm and they have every right to be in the field as there is public access. Once they left the field the birds inside calmed down and half an hour later the juveniles returned. Whilst very frustrated that my working day had just been extended I do have to thank the mystery couple. 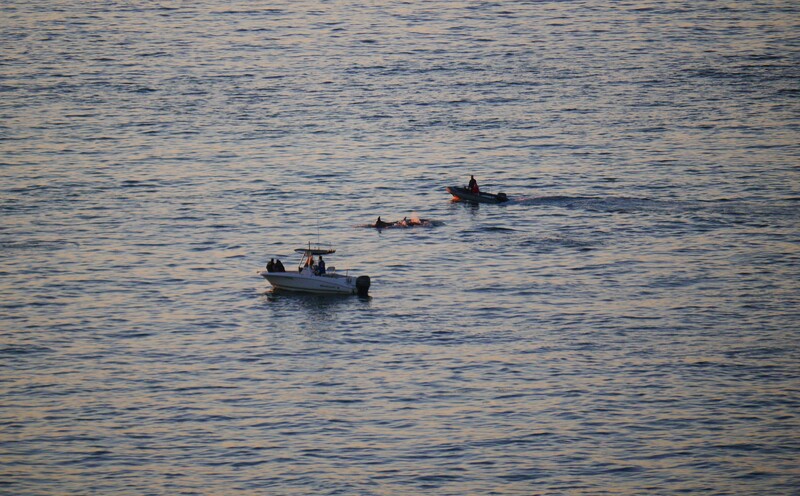 If I had not have gone looking for the juveniles on the cliff I would not have seen the small pod of dolphins swimming across the bay! The hand-reared chick in the release aviary. Photo by Liz Corry. 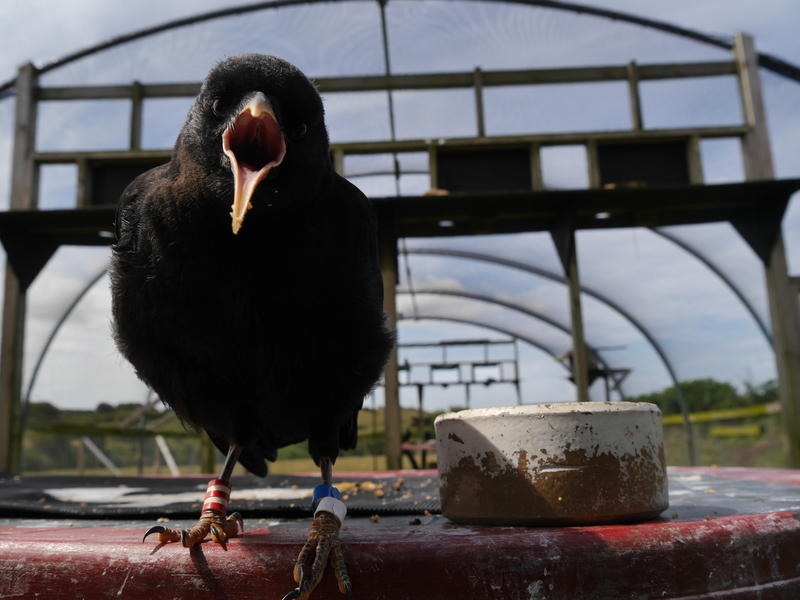 Last month we reported on how we moved our hand-reared chick up to the release aviary whilst still a nesting so she can fledge in the aviary and learn from the other choughs. 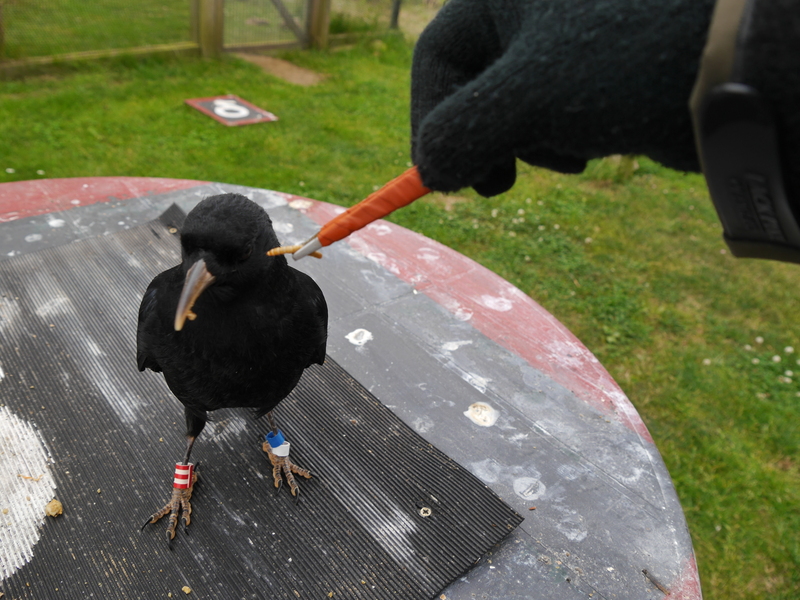 She had a rocky start overwhelmed by her new surroundings and the very loud gang of choughs that would descend en mass at least twice a day on the aviary. She didn’t have any other clutch mates to look to for support and became very dependent on myself and Harriet hand-feeding her. She fledged at the start of July and started learning to feed for herself. We began weaning her off the hand-rearing diet and teaching her to fly to the target areas for food. However we quickly started to realise we had a problem. She learnt to fly…on to our shoulders. Last year’s hand-reared chicks started doing this at a similar age. We never encouraged it, didn’t reward them with food, and in the nicest possible way shood them off. They quickly stopped and have not attempted it ever since. They have now attained a nice balance of being comfortable around staff for feeding and management purposes but at a safe distance from any ‘predation’ threat. This chick has a unique ability to cling to your like some sort of gecko and no matter how hard you try will not leave you. She has imprinted on staff associating them with food and companionship. When the parent-reared chicks arrived she showed no interest in them. When we mixed her with them there was still no interaction. However we did have a problem of the other eight finishing off all the food. Our chick likes to feed when we are present then maybe graze a little throughout the day. When we were not there she had no food. When we were there she would be frantically begging, following our every move, and throwing herself at the keeper door to get to us. We noticed her body weight going down each day so we increased the daily food allowance and gave extra dishes to reduce competition. When we gave the group access to the poly tunnel they had more time to explore and find food in the grass. Stress levels have been turned down a notch as a consequence. She will feed side by side with the other chicks and there is no aggression. When they react to something she will react and vice versa. There is a level of social cohesion there. Whether it is strong enough for out in the wild is a question we will face closer to the release date. We need to be confident that she will not be completely naïve when faced with a potential threat whether it be falcon, dog, human, etc. However much her begging down our ear canals might grate and that her clingy nature means it takes at least twice as long to leave the aviary, it is a real privilege to work with a bird like her. 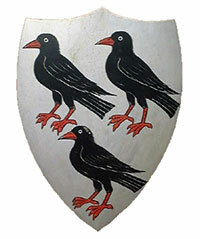 She’s made me re-read Corvus: A Life with Birds by Esther Woolfson with greater appreciation. If our hand-reared chick is to return to the wildlife park she will get to move into the newly renovated display aviary. 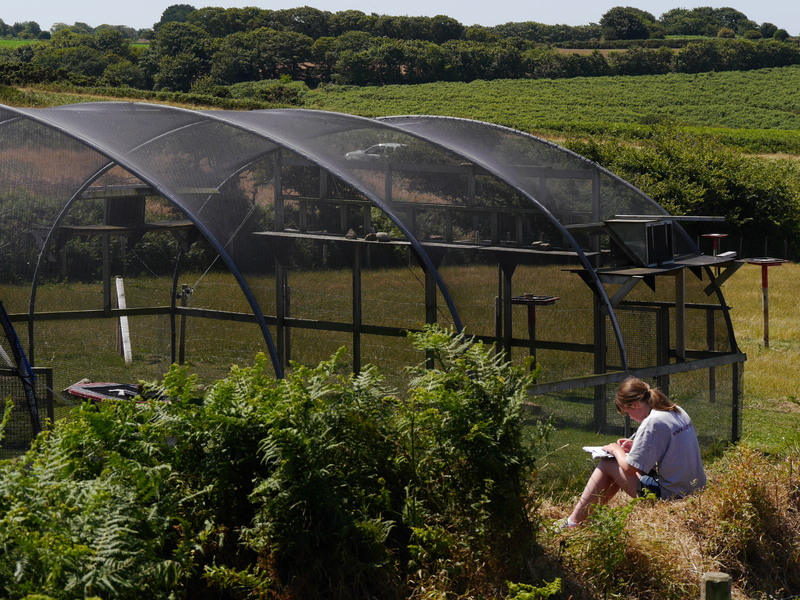 There is still a long list of jobs which require ticking off before the choughs can move back in, but the netting at supporting uprights are now in place. Once it is ready Gianna and the other six birds currently off-show to the public can also move back in. Paul Pestana completed his three month placement on the project at the end of June. He extended his time so he could be there when Dusty fledged. Paul is hoping to continue working in conservation, this time in New Zealand a country with lots of experience at re-introductions and restoration work. In the meantime he is off to Kyrgyzstan on holiday! We have set him the challenge of finding a chough and sending back a photo (its not impossible they are resident there). Before Paul left he spent a couple of weeks helping our new student Erin O’Brien settle in. 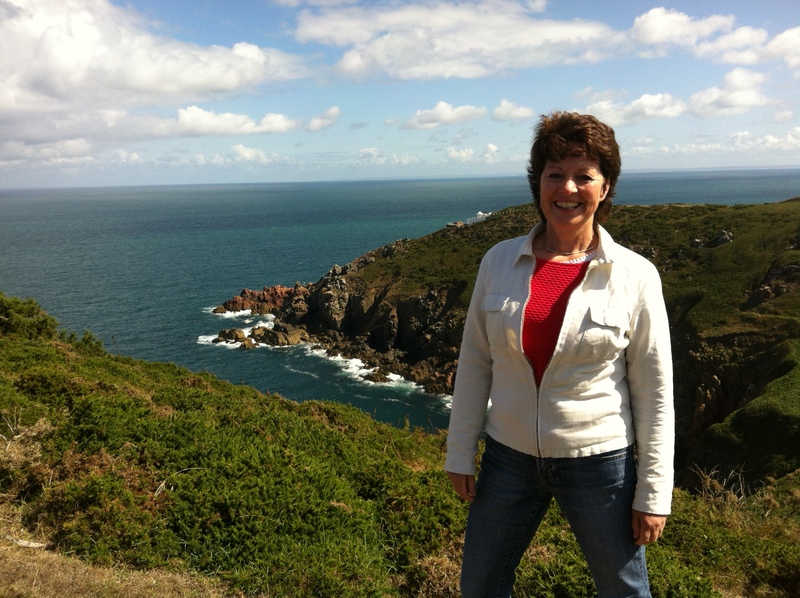 Erin is returning to Jersey after completing her degree at the University of Exeter. Like Paul, Erin will spend three months with us and help with the release of this year’s chicks. 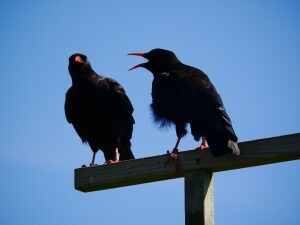 On 29th July, Birds On The Edge was again in the spotlight when the team from the BBC’s long-running radio programme Open Country interviewed Harriet and Glyn with the choughs at Sorel. Producer Alasdair Cross and presenter Helen Mark caught up with the team and the chough flock on a beautifully sunny and calm morning. 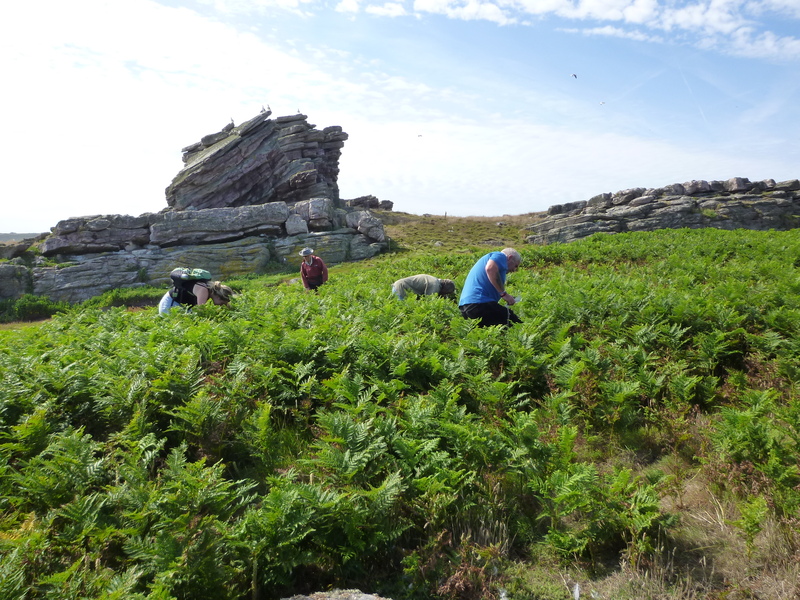 The Open Country team learned all about Birds On The Edge and its work with local farmers and helping birds through the winter, and the project to bring back the red-billed chough. 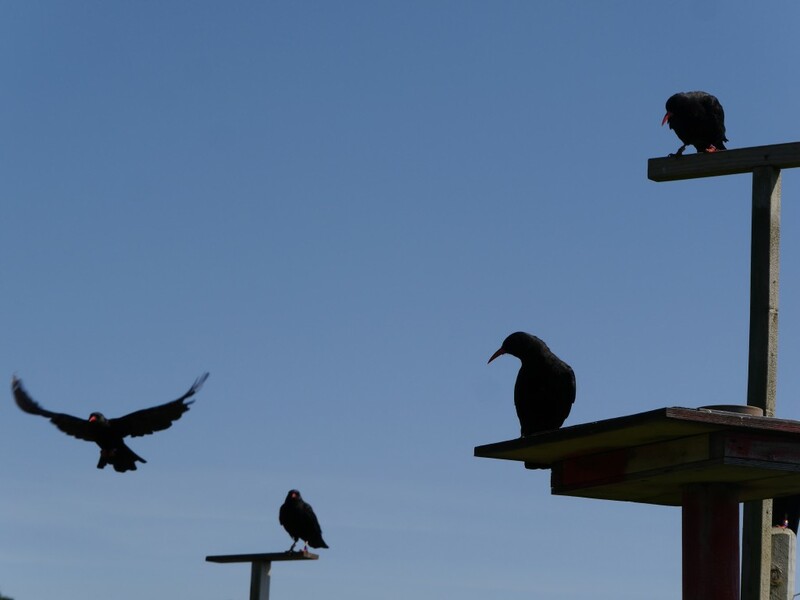 All 16 free-flying choughs were present and performed perfectly for their starring role. Harriet was even able to point out Dusty’s voice in the flock amid the general chough chatter. 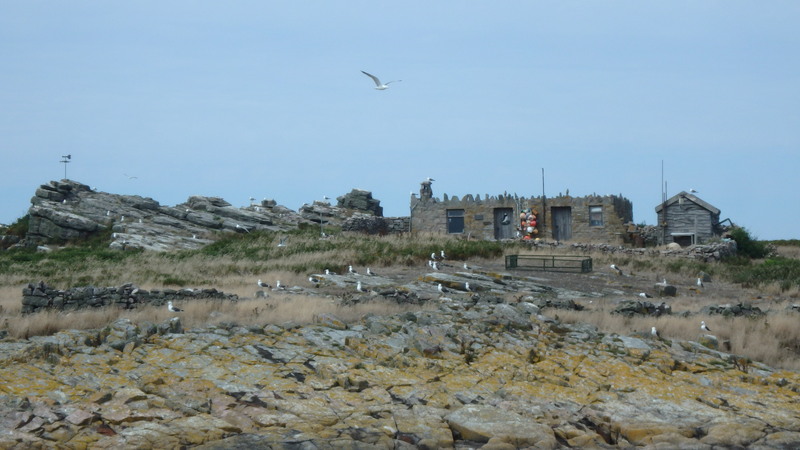 During their stay in the Island, Alasdair and Helen also interviewed BOTE stalwarts, Mike Stentiford and Bob Tompkins as well as people in other walks of life in the countryside including archaeologist Matt Pope. Open Country will be broadcast on Thursday13th August at 3pm on BBC Radio Four and repeated at 6am on Saturday 15th August. The episode recorded in Jersey, and others in the series, can be heard again on iPlayer here. Alasdair’s recording of the chough calls at Sorel can be heard on the Sounds Of Our Shores website. On the weekend of 17-19th July the Channel Island ringers (including Cris and Harriet from Birds On The Edge – see their notes below), led by Chris Mourant, joined forces with our small team from the Alderney Wildlife Trust for a weekend of storm petrel ringing on our small islet of Burhou. 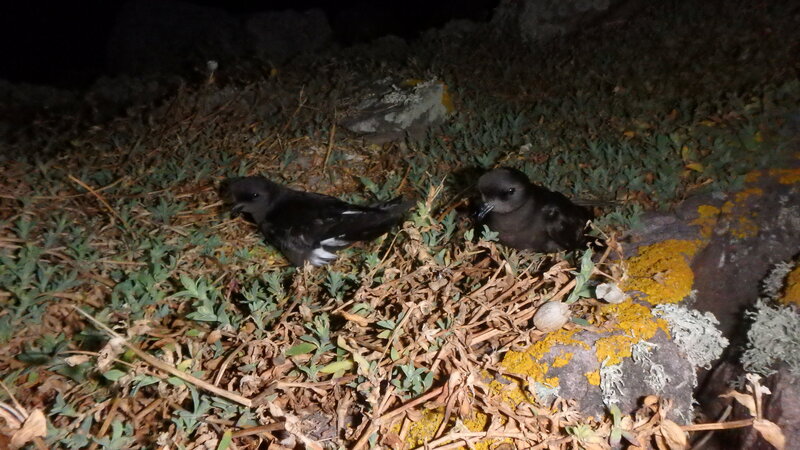 Until a few years ago Burhou was thought to home only 20+ breeding pairs of European storm petrel; however, these days the numbers are estimated to be over 1,000 breeding pairs! 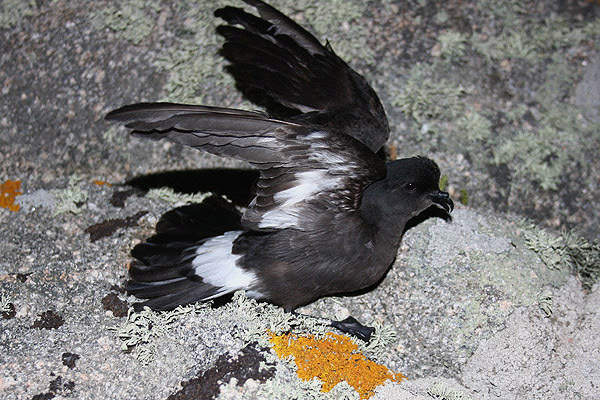 The European storm petrel is included in Annex 1 of the EU Birds Directive. Once we had set up camp, in and around the small hut (which was built by the warden in the late 1980’s), the eight-strong team headed out to the eastern end of the 1km long island to set up the mist-nets. 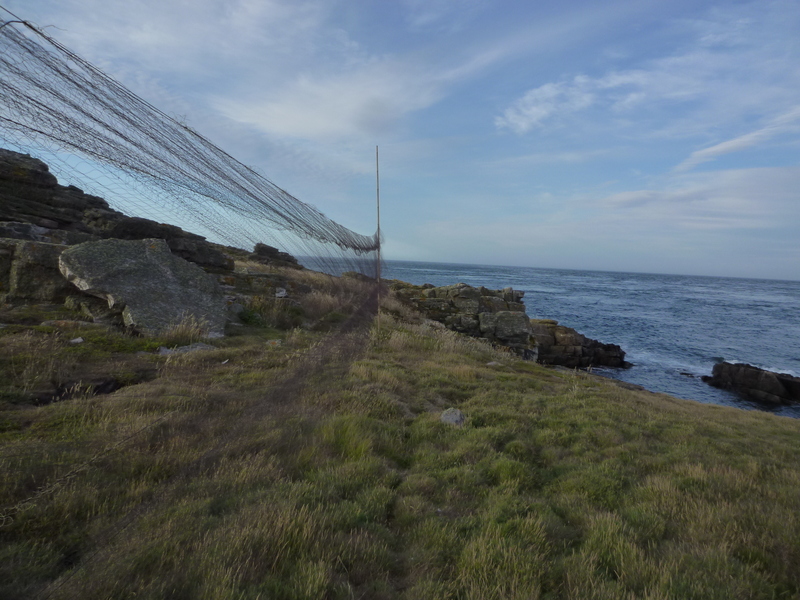 We used four 18m long mist-nets which we set up and furled in the early evening. 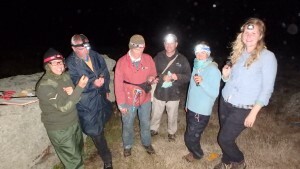 It wasn’t until it was completely dark that we walked back to the nets to attempt our first catch of birds. Everyone had made ‘guestimates’ of when we would catch out first bird but nobody got it spot on as we landed our first bird at 22.25. We had organised the group into extractors, runners and ringers to make sure there was a fast turnaround of the birds, a system that worked extremely well. As part of the extracting team, and having never seen a storm petrel in the hand, nothing could have prepared me for how tiny they were, especially their webbed feet, which just about covered the area of my index finger nail! Before we all knew it, it was 2am and we had caught close to 200 new birds and over 80 re-traps – most of which were birds caught and ringed last year as adults. This means we can use the re-trap data to confirm that the birds caught last year were most likely breeding adults and not wandering birds that had strayed off course! 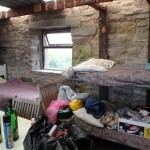 We all headed back to the hut elated and ready for another stint the following night. After a busy day working our way through the lesser black-backed gull colony looking for rogue chicks missed on the previous weekend’s ringing trip, and after a much needed nap, the group headed out to set up nets for another night of storm petrel ringing. 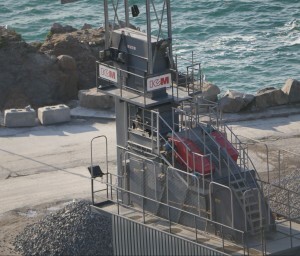 This time the decision was made to try the nets on the north-eastern end of the island, something that hadn’t been attempted since before 2008. The risk was worth taking as the birds started streaming in gradually from about 22.15. It was a lot steadier than the previous night where all the birds seemed to land within the first couple of hours! At 3am we decided to call it a night as we were all beginning to get tired and we wanted to give the birds a chance to get back to their chicks. It wasn’t until the morning and the numbers were calculated that we realised we had caught another 175+ new birds and over 60 re-traps. “With the puffin colony right next to our basecamp, the seals keeping a vigilant eye on us, and the great company of fellow researchers, it was difficult to think of leaving. 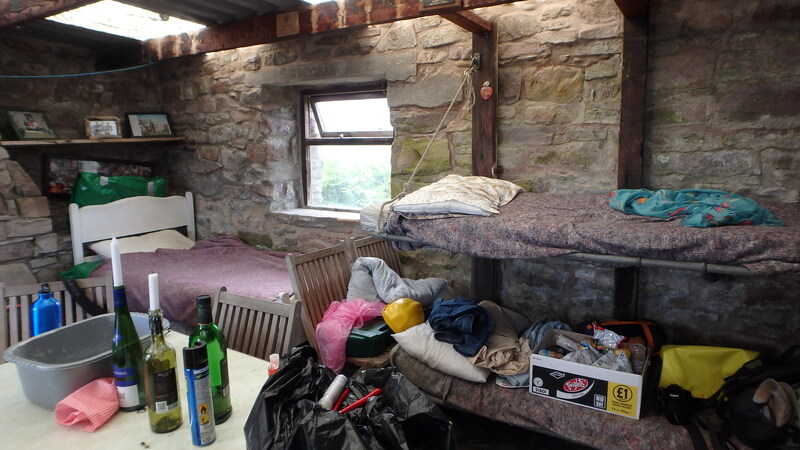 At times, we might have even been overcome with enthusiasm, as we had to be dragged out of the bracken during the day, and again at 4am back to the hut, as we couldn’t see the time to stop looking for gull chicks, or to stop catching storm petrels. 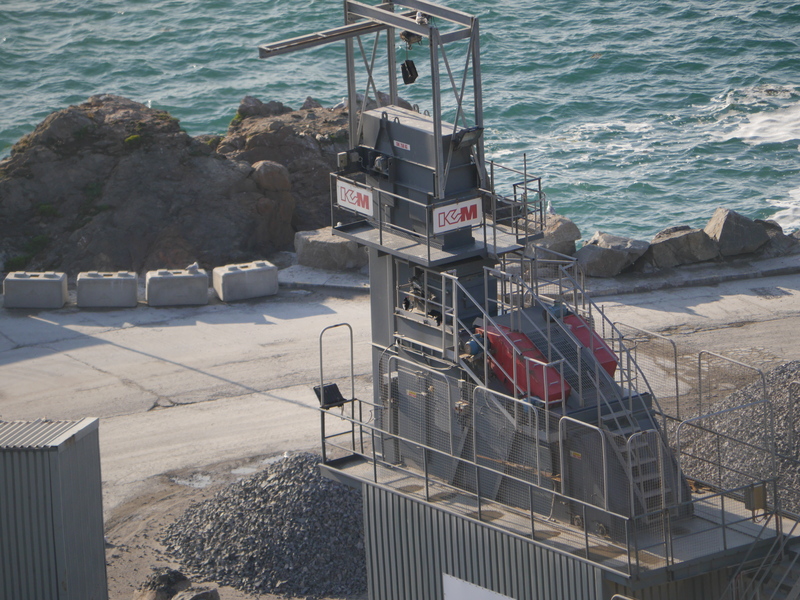 Apparently, rest is important on such intense operations – good thing the others were looking out for us”! 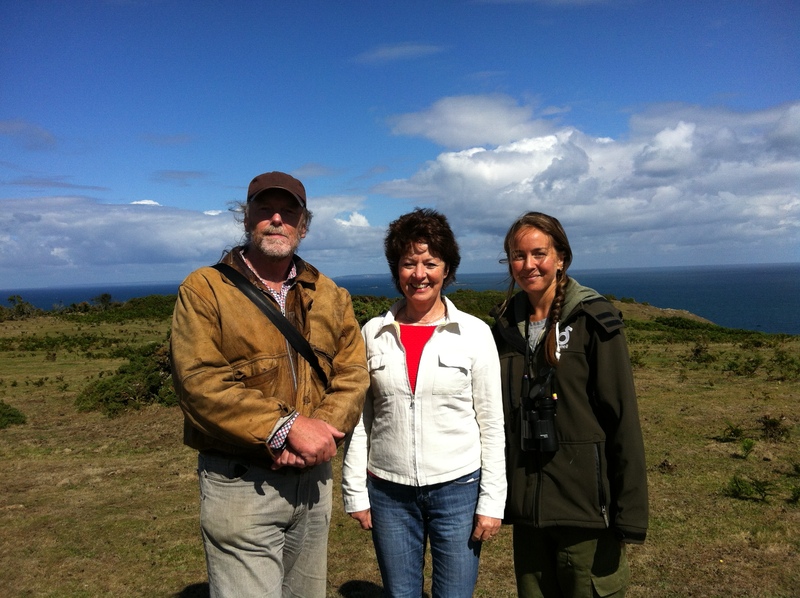 A huge thanks to the Channel Island ringers involved and to the Channel Island Ringing Scheme for giving permission for us to ring the storm petrels on Burhou. It was an experience the team certainly won’t be forgetting anytime soon! 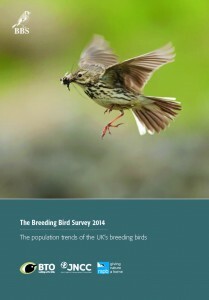 Some stay, some go, but 2013 to 2014 was a good year for many of Britain’s birds. 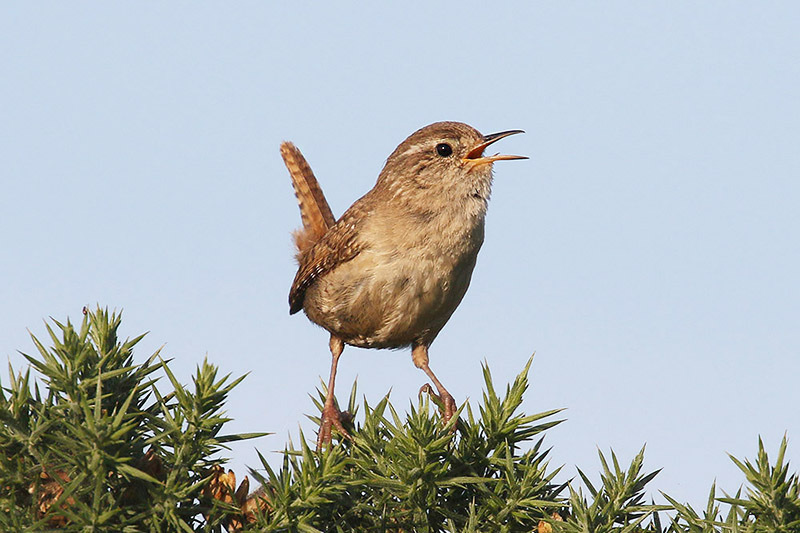 The latest results from the BTO’s Breeding Bird Survey (BBS) brought some short-term, positive news for a number of both migratory and resident species against a backdrop of long-term declines for many, long-distance migrants in particular. The possible reasons for these short-term increases vary between species. There is no evidence that the 2013 breeding season was a particularly good one, and for some species it was a poor season, probably related to the fact it was the UK’s coldest spring since 1962. Lesser whitethroat (+ 34%), common whitethroat (+ 18%), tree pipit (+ 31%), willow warbler (+ 6%) and the familiar cuckoo (+ 27%) are among the long-distance species, that travel south of the Sahara for the winter months, to have increased between 2013 and 2014. The survival of migratory species like these is thought to be influenced by rainfall levels in the Sahel, just south of the Sahara. This applies for both species that spend the winter there, such as two whitethroat species, and those that use the region as a stop-over site (to rest and refuel before continuing further south) like the willow warbler and cuckoo. Rainfall levels affect the availability of insect prey on which these species rely. Rainfall in the region during the summer of 2013 was just below the long-term average, so this doesn’t provide a ready explanation for the respite seen in this year’s BBS report, but the three years previous to this included two that were amongst the wettest since the late 1960s, possibly leading to generally better conditions in the area in the winter of 2013/14. Despite the favourable short-term trends revealed in the BBS report, the long-term trends for many of ‘our’ migratory species are not so positive. 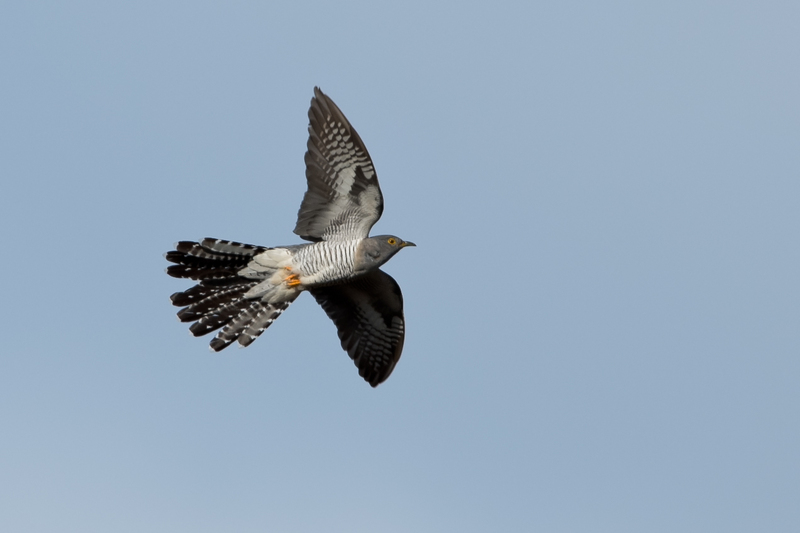 Between 1995 and 2013, cuckoo declined by 46%, spotted flycatcher by 47%, whinchat by 54%, wood warbler by 58%, pied flycatcher by 60% and, as reported here before, turtle dove by 91%, with large decreases also found in several other species. There are many factors throughout the migration route and on the wintering grounds that could be playing a part in the alarming decline of long-distance migrants. Wetland loss and degradation and the clearance of wooded savannah is likely to be affecting the wintering grounds of long-distance migrants, and the loss of migration stop-over sites, and hunting and trapping along the way, may compound the problem for some species. The latest BBS results show positive changes in numbers of some partial migrants (species in which some individuals stay in the UK for the winter, while others venture as far south as North Africa). 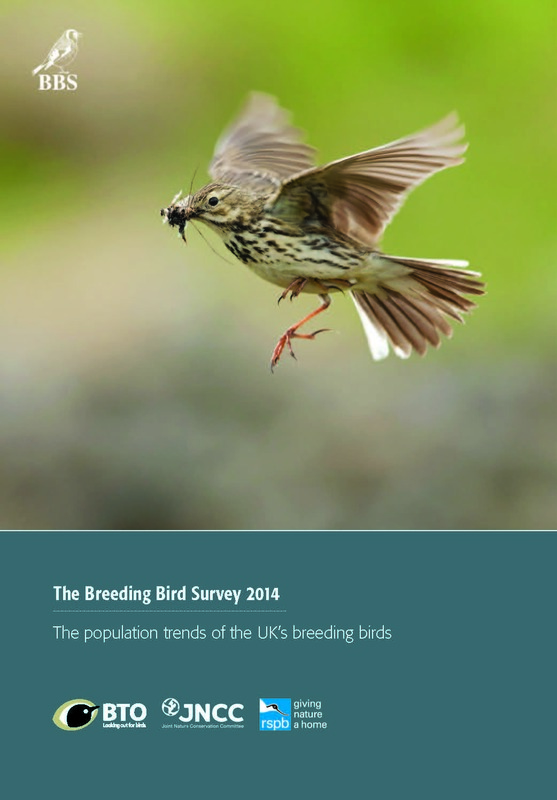 Increases between 2013 and 2014 were found for chiffchaff (+ 21%), blackcap (+ 14%) and meadow pipit (+ 14%). 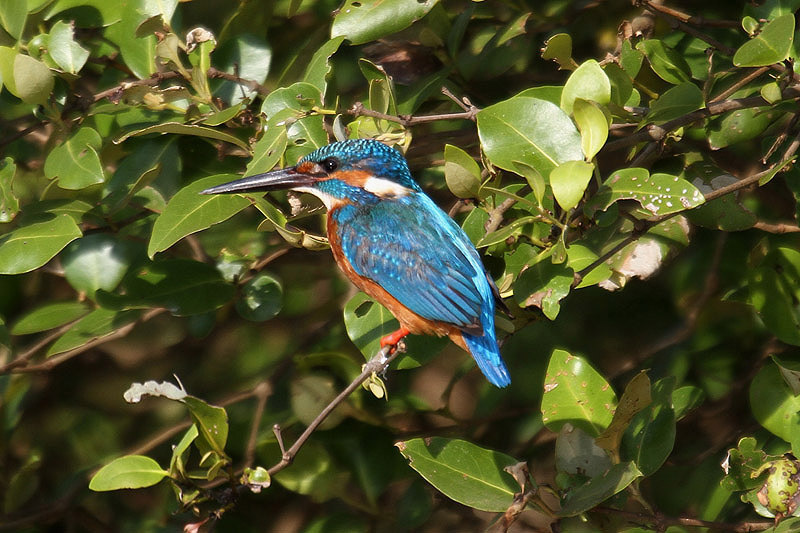 There was good news too for some resident species which remain in the UK for the winter. There were short-term increases for stonechat (+ 76%), kingfisher (+ 50%), grey wagtail (+ 50%) and wren (+ 34%). Residents are susceptible to harsh weather conditions when life gets tough, both in terms of finding food and expending extra energy just to keep warm. 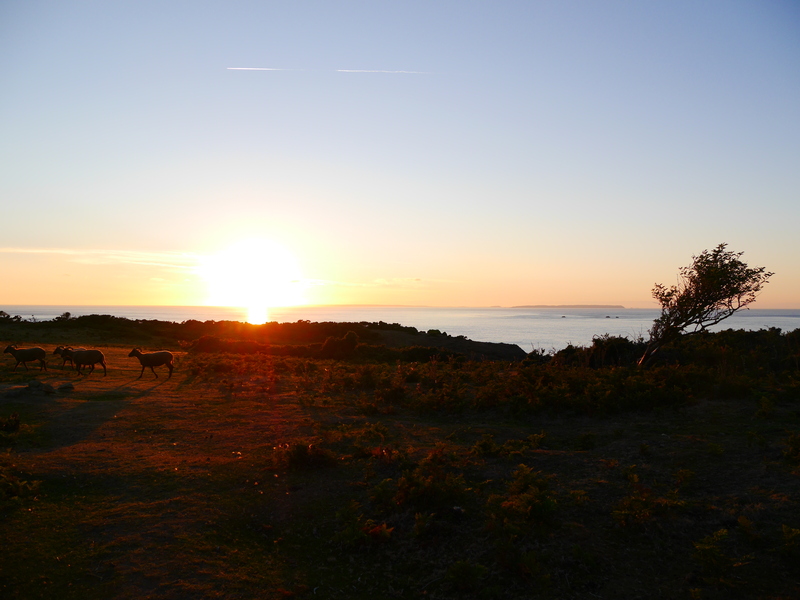 The Channel Islands have submitted dated to BBS since the project started and, for the second year running, 25 squares were covered with 76 species recorded. 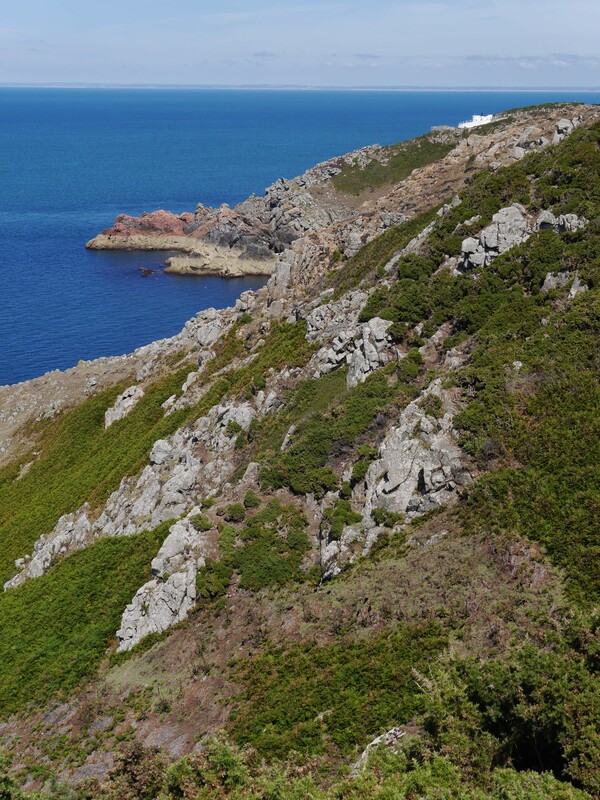 This is a stable level of coverage and one hoped to continue with the assistance in future of the Alderney Wildlife Trust.